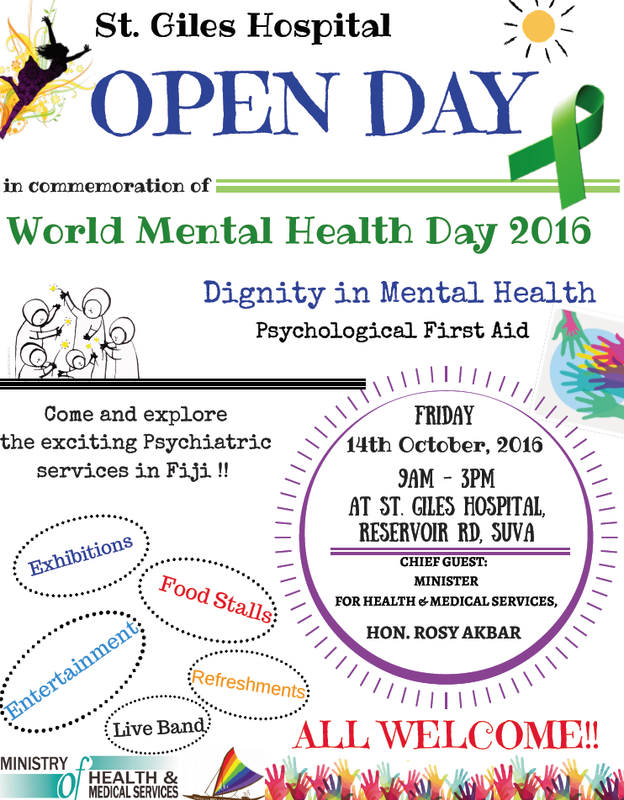 Come and join the celebrations at St Giles for World Mental Health Day, Friday 14th Oct 2016. Increasing community based programs is one of the key strategies of the Ministry of Health and Medical Services to raise awareness on the reproductive health development. Minister, Hon. Rosy Akbar reiterates that it will be achieved through providing a comprehensive and integrated reproductive health services in communities. “In providing an enabling environment, the Ministry of Health and Medical Services is committed towards improving the accessibility to reproductive health services. The International Conference on Population Development (ICPD) Plan of Action affirms that reproductive rights embrace certain human rights that includes the recognition of basic rights of individuals to have the information and means to access highest standard of Reproductive Health services. Fiji is one of the Pacific Island Country (PIC) signatories of the ICPD. “The Reproductive Health Policy of Fiji explicitly supports the rights of all women and men to have access to curative and preventive reproductive health services. It also takes note of the rights of young people to have access to youth friendly services, access to reproductive health information that will help them make responsible choices and in particular prevent unplanned pregnancy, STIs/HIV. “The role of Non-Government Organizations (NGO’s) in raising awareness at community level on Reproductive Health and Family Planning services is notable. And linking of the public sector with these organizations has significantly contributed towards improving access to services especially to those hard-to-reach vulnerable groups,” Minister Akbar said. The Health Ministry will also capitalize on a collaborative platform to enable active participation of the communities in responding to the reproductive health issues. “Increased awareness is the key to enable the communities to understand the impact of Family Planning on their future health, livelihood and wellbeing. Strengthening the health systems response to unmet needs in terms of specialized nurses in Family Planning through provisions of training, availability of information and guidelines on Family Planning also needs to be addressed. “It also means increasing accessibility of counseling services at all levels of health system including the community level. And empowerment of community health workers and general awareness on booking for antenatal clinic and through the stages of prenatal and postnatal care are some of the ways the Ministry will enhance the community based programs for reproductive health services,” Minister Akbar added. Management of gynaecological morbidity – including reproductive tract cancers & infections.